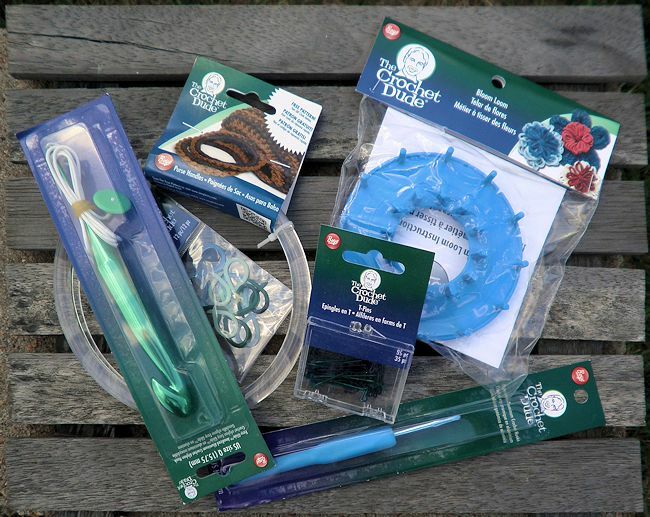 For those of us who know and love Drew Emborsky, aka The Crochet Dude, Boye has a variety of products available in The Crochet Dude supply line – enough to satisfy just about every need a crocheter (or knitter) might have. I found 41 items on the Boye site with prices ranging from $1.29 for a Knit Tally to $49.99 for an Organizer Tote. To be honest, I’m not a fan of Boye hooks, except for the steel ones. I don’t care for the hook shape, but that doesn’t stop me from using them when I need a hook for a specific project when no other hook will do! In addition, the Boye and Susan Bates sizes don’t match millimeter-wise so it’s something I always have to consider. Stitch Marker Rings – $1.99 – These rings are split ring flexible plastic markers suitable for either crochet or knitting. The package includes 12 markers. Out of the package of 12 markers, at least two of them didn’t meet at the tips, much less cross each other and one other marker had barely crossed tips. This would make it hard to use to mark your stitches as they would easily slip off. The remaining markers varied in how much the tips crossed each other, which doesn’t affect how they work but they would look better if they were all more consistent. A bit more quality control is needed when putting this package together to make sure that all tips cross each other sufficiently. There are also some beaded stitch markers to mark what size hook you used on a project. I couldn’t see the back of the package online but they’re using French hooks (like for earrings) and if there is no way to close the hook (which I couldn’t see a way to do that), then I’m not sure how they’d stay attached to the project. Bloom Loom Kit – $2.19 – This loom is a circular peg loom with two rows of pegs which can be used to make either a 2″ or 3.5″ pom pom flower. It includes a needle and instructions on making three types of flowers: flat, double, and circular. The flowers can be used to add to hats, purses, clothing, and whatever else strikes your fancy. T-Pins – $2.19 – This set of 35 T-pins can be used for all kinds of craft projects from blocking your work to holding your macrame cord (I remember using them for this when I was a teenager). The pins are made of metal, are blue and green, rust proof, and won’t snag your work. Aluminum Ergonomic Crochet Hook, Size H/5.00mm – $5.99 – This hook has an ergonomic handle to it with flat edges on two sides of the handle. I usually find that most ergonomic handles don’t work very well for me since I hold my hook like a knife but this one worked perfectly. My thumb fit nicely on the bottom while my index finger hooked exactly at the right spot on the top flat section. The point of the hook is the typical Boye shape, more blunt/rounded than Susan Bates and a shallower groove. There’s plenty of shaft space before the plastic handle/thumb rest, leaving plenty of room for multiple loops. Sizes are available from B/2.25mm to N/9mm with prices at $4.99 for sizes up to size E/3.5mm and $5.99 for larger sizes. Aluminum Crochet Afghan Hook – Q/15.75mm – $7.99 – The afghan hooks are available in sizes L, P, and Q. The consist of a short hook, just large enough to fit in your hand with a long plastic or nylon cord with a plastic stopper at the end, perfect for Tunisian Crochet. Round Plastic Purse Handles – $6.49 – These round plastic purse handles are light weight but strong enough for years of use. They can be used for purses that are made with crochet, knit, fabric, macrame, or whatever type of construction you can think of. Also available is a U-shape handle and one can only hope they come out with a D-shaped handle (crosses fingers and wishes hard).